NASCAR Race Mom: #NASCAR Driver Ryan Blaney to Guest Star on NBC's "TAKEN"
NASCAR driver Ryan Blaney will guest star in the upcoming season of NBC’s "Taken" (premiering Jan. 12). 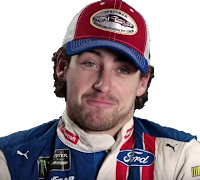 The episode, titled "Imperium," will air in 2018 and will feature Blaney as a Special Agent with a very particular set of driving skills. When a dangerous weapons dealer smuggles his wares into New York City, Bryan Mills (Clive Standen) teams up with the FBI in a race to stop him before he reaches the safety of international waters. Update from #Taken we have reached our 11th hour on set. I’ve grown hungry, sleepy and in much need of a beverage. Also it’s -2 degrees. BUT, I am having a lot of fun trying to not break the camera. From executive producer Luc Besson ("Taken," "The Fifth Element"), "Taken" is a modern-day, edge-of-your-seat thriller that follows a young but deadly Bryan Mills (Clive Standen, "Vikings"), former CIA spy Christina Hart (Jennifer Beals, "The L Word," "The Last Tycoon") and a team of covert operatives as they embark on rescue missions around the world – a job that employs Bryan’s very particular, and very dangerous, set of skills. In 30 years, this character is destined to become the Bryan Mills that we’ve come to love from the "Taken" films. Also starring Adam Goldberg ("Fargo") and Jessica Camacho ("The Flash"). Executive produced by Besson, Greg Plageman and Matthew Gross.